is an internationally acclaimed performer, composer, cultural entrepreneur and music educator. His relentless service in promoting Indian music has made him a highly respected figure in the field of music and education across the world. A protégé of Bharat Ratna Pandit Ravi Shankar, Shubhendra Rao has established himself “not only as a master of his instrument but also as a thinking musician, constantly endeavouring to carry his instrument beyond conventional boundaries” and “a musical bridge to many cultures” Critics and connoisseurs hail him as a worthy successor to his Guru’s tradition. Internationally, he has performed at major music festivals and prestigious concert halls like Kennedy Center for Performing Arts, Sydney Opera House, Salzburg International Music festival, National Centre for the Performing Arts in Beijing, National Arts Festival in South Africa, BRICS Summit in China, Theatre de le Ville in Paris. In India, Shubhendra Rao has performed at major music festivals in India including Doverlane Music Conference, ITC Sangeet Sammelan, Baba Harvallabh Sangeet Mahasabha, Shankarlal Festival, Gunidas Sammelan, Sankat Mochan Sammarroh, Kashi Utsav, Swami Haridas Sammellan. Award’ for his contribution to Art and Culture. A child prodigy who started playing sitar at the age of 3, he grew up in a musical family. His mother Nagarathna is a Saraswati Veena player. His father, N.R.Rama Rao, a disciple of Pandit Ravi Shankar himself, was his first teacher. Shubhendra had his first lesson from the Bharat Ratna Ravi Shankar at the age of 8. At the age of 18, he moved to Delhi, living with and learning from his Guru in the traditional Guru-Shishya parampara. As a budding artist, he was the recipient of Youth State scholarship for music, Karnataka in 1975 and National scholarship for music from Ministry of culture in 1977. An A- Grade artist of All India Radio for over 25yrs, Shubhendra Rao is a regular performer on Radio and National Television. As a composer Shubhendra Rao distinguishes himself to push to boundaries of classical music and creating music for artists across cultures. He has composed for and worked with Dutch Cellist, Saskia Rao-de Haas, American Jazz Guitarist Freddie Bryant, Iranian musicians, Japanese legendary singer Ryoko Moriyama, Chinese Pipa maestro Gao Hong, Bilbao Symphony Orchestra, Chinese National Orchestra amongst others. He is also an accomplished composer. His ‘When Gods Meet’ was commissioned by Padma Vibhushan Dr Sonal Mansingh for her dance production. The New York Times described his composition, ‘Yathra’ as ‘movingly meditative’. His composition ‘Ekta’ to honour German Chancellor Angela Merkel’s visit to India in 2015 was described as ‘exemplifying the very best in the musical traditions of the East & West’. his wife, Saskia Rao, he has created India’s first ever music curriculum for children, Sangeet4All. This early childhood music education program has already influenced over 20,000 children and the numbers are growing. As the Indian delegate of the Creative Youth Development Conference hosted by the Massachusetts Cultural Council, he collaborates with an international team of experts on creating effective international policies on Child & Youth Arts Education. He is an active supporter as a performing artist for SPICMACAY for the past 30 years, performing over 50 concerts every year. As an empanelled Guru and performer of ICCR, Shubhendra Rao has trained many foreign students who, in turn, are teaching Indian music across the world. In his own words, “Music is a gift bestowed on me since childhood. Knowing and realizing its power, I wish to bring the joy of music into every child’s life, not necessarily to make him/her into a musician but to make him/her a better and sensitive human being. Saskia Rao-de Haas is a world-renowned virtuoso cellist, composer, cultural entrepreneur and educationalist from the Netherlands. She was trained as a Western cellist from a young age onwards, but changed direction when she came in touch with Indian music in 1993. She is known as a master performer in Indian classical music and hailed as the creator of a new instrument: the Indian cello. Flute Maestro Pandit Hariprasad Chaurasia speaks of his disciple Saskia as “someone who has been taught by God.” According to him, “everybody should listen to her music”. Her compositions with her Sitarist husband, Pandit. Shubhendra Rao are well known all over the world. Critics and audiences alike have praised her for artistic depth and technical virtuosity. 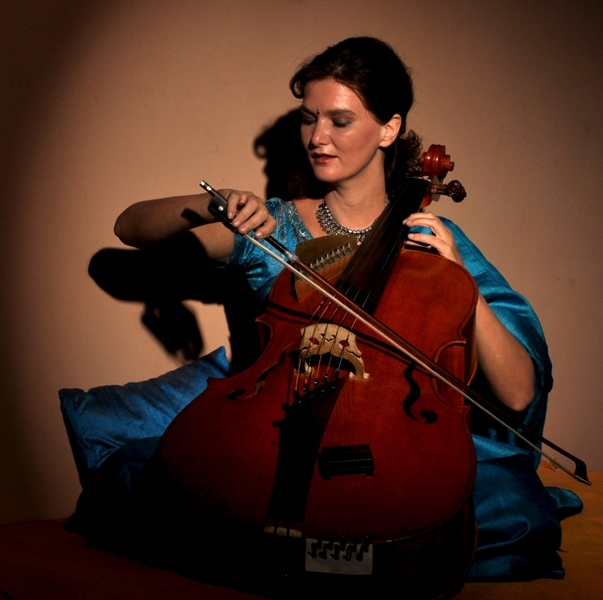 Saskia has performed at all the most prestigious concert halls across the world, such as the John F. Kennedy Center for Performing Arts in Washington DC, Musee Guimet in Paris, and the New Directions Cello festival. She is the first non-Indian artist to have performed as a Soloist at the prestigious Doverlane Music conference in Kolkata. As a composer, she is eminent at bridging the Western and Indian classical music traditions. Along with Pt Shubhendra Rao, she has composed music world leaders like German Chancellor Angela Merkel, Prime Minister Narendra Modi and the Dutch Prime Minister She co-founded the Shubhendra and Saskia Rao foundation to promote the joy and benefits that Indian classical music can bring to children. She created the first complete music curriculum for Indian music for young children based on 6 storybooks. Over 20,000 children have already benefitted from the ‘Sangeet4All’ music curriculum. The books Saskia has written help children to experience the importance of having music in their lives and the transformative power of the Indian classical music traditions. Teacher handbooks, songs, instruments, workshops, teacher community and over 400 lesson plans accompany the storybooks to ensure proper implementation of the curriculum. Saskia lives in New Delhi with her husband and their gifted pianist son Ishaan. is a young aspiring pianist and sitarist living in New Delhi. He is the son of world-renowned musicians, sitarist Pt Shubhendra Rao and Dutch cellist Saskia Rao-de Haas. Since a very young age, he has gone on concert tours all over the world with his parents and has performed at various programs with them. Ishaan started learning the sitar and the cello at the age of 3, and the piano at the age of 6. He currently learns piano from American pianist Justin McCarthy and Russian pianist Svetlana Radashkevich in New Delhi and sitar from his father Pt. Shubhendra Rao. He made his solo piano concert debut at the age of 9 in New Delhi. He was selected as a special performer for the 2017 ABRSM concerts in Delhi and Lucknow and has performed in India and abroad from 2014 onwards. In 2017, Ishaan was the youngest Indian to complete his ARSM performance diploma in piano. The same year, Ishaan also performed a 45 minute-long program for an international jury as a finalist in the ‘Young Musician of the Year’ award by the Olga and Jules Craen Foundation in Mumbai as the youngest candidate selected. This year in September, he also performed at the Desert Song Festival in Alice Springs, Australia. Ishaan follows piano, jazz, improvisation and composition classes by Greek pianist, composer and multi-instrumentalist Dimitris Lambrianos. He also followed multiple masterclasses by Polish pianist Raphael Lustchevsky and French pianist Martine Dellenbach. Ishaan’s repertoire is as varied as his musical training. From Bach, Mozart and Beethoven to Brahms and Chopin to jazz standards, not to mention his own compositions, Ishaan connects to all. With his deep understanding of different stylistic approaches to music, it is not surprising that Ishaan started writing his own compositions at the age of 5. His approach to music is to bridge musical traditions and to show his audiences that music knows no boundaries: western classical, Indian classical, jazz, blues and contemporary music, Ishaan not only seamlessly performs one after the other, but shows that music is one and the same universal language. Ishaan also teaches piano to underprivileged children and has performed and helped to organize the ‘Music For Children By Children’ series to promote classical music among children. Pradeep Chatterjee is a top rated artist on All India Radio and Television. He has travelled and performed widely throughout India and abroad. He has accompanied many of the stalwarts of the contemporary Indian Music scene as well a performing solos. He is a disciple of the Late Pt. Amalesh Chatterjee and has continued his studies with Pt. Samir Chatterjee. This event is part of the 2019 Annual All-Night Concert. Click on the button below for more details.